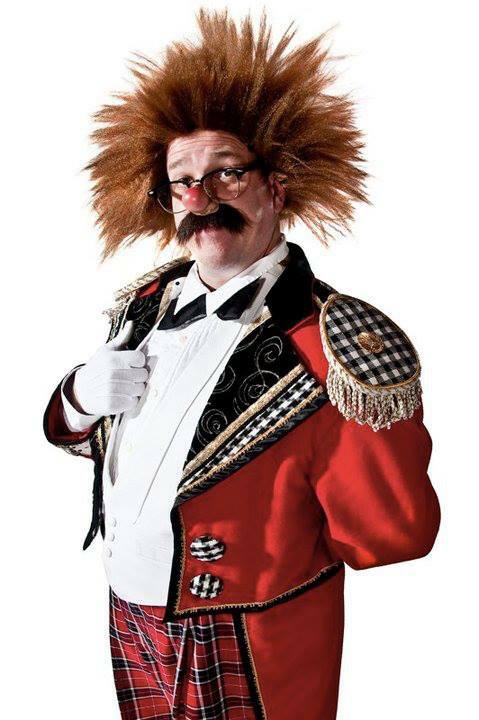 Talented comedy wire walker as well as a great clown in the ring, Pio Nock. My pal Kevin Brown, who rocked 'em and rolled 'em in China with this gag, seen here performing at the Clown College reunion in Myrtle Beach, SC. 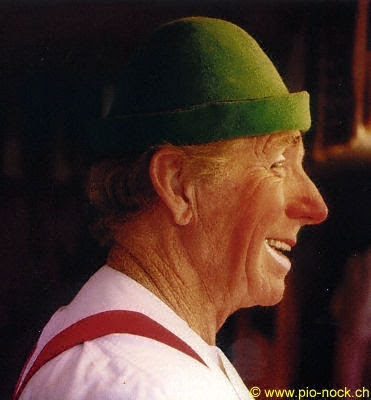 The smiling face of Edwin "Poodles" Hanneford. I don't think that I ever realized before just how closely related Poodles makeup is to that of Michael "Coco" Polikovs, just add a putty nose, a wig and a sailor hat and I think that you're most of the way there. 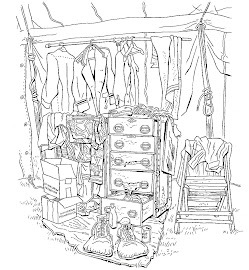 But I don't think that Mike was much of an equestrian and I don't think that Poodles was noted for stilts or soap gags, so the similarities end there. They were the consummate circus power couple when an equipment malfunction during a Big Apple Circus performance grounded daredevil aerialist Pedro Reis only two days after he proposed to “Queen of the Air” Dolly Jacobs. After recovering from his accident, Reis experimented with other circus acts and created an aerial pas de deux with Jacobs called “On Wings Of Love”, but the flame and passion for performing had scarred him. 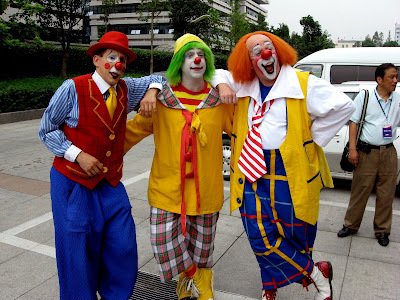 They then decided to form their own circus, but one with great heart and a mission to serve the community in a way that no other circus had before. In 1997, Circus Sarasota was born in Sarasota, Florida, the historic home of Circus King John Ringling and his wife, Mable. Jacobs and Reis took every risk, financially and emotionally, to nurture and build Circus Sarasota into an organization that made everyone proud. Their critically acclaimed seasonal performances in February have elevated the profile of the circus arts, building a following among those who normally frequent opera houses and concert halls. Throughout the year, their professional clowns provide therapeutic outreach and meaningful encounters with individuals in institutions such as nursing homes and adult day care centers. Professional circus performers also provide a curriculum-based educational program in local schools and after-school centers. Over 5,000 individuals young and old every year are touched by their programs. Circus Sarasota celebrated its 10th season in 2007. “We had waited long enough to get married and now Circus Sarasota is not only stable, but successful,” says Reis. Their wedding takes place today, Friday October 26, 2007 in the courtyard of the John and Mable Ringling Museum of Art with over 250 guests from far and wide in attendance. Born to circus stardom, Dolly Jacobs the daughter of legendary clown, Lou Jacobs, was a headliner with her balletic aerialist Roman Ring act. Her father, who passed away in 1992, will be remembered with a memorial on each guest table at the wedding. 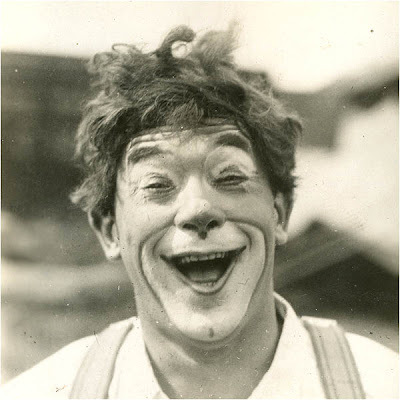 Pedro Reis, who received his circus training at a YMCA in Cape Town, South Africa, was also a headliner. He created the Survivors, an aerial act that was considered one of the most daring in circus history and later as a solo aerialist on the cloud-swing, another death defying act. He and Jacobs first met while rehearsing with the Ringling Brothers, Barnum and Bailey Circus. As their relationship grew, many in the circus world whispered that their love was reminiscent of another great aerialist couple – Lillian Leitzel and Alfredo Cordona who, in the early 20th century were considered the most spectacular aerialists of all time. Tragically, Lillian fell to her death in an equipment malfunction and Cordona pined for her the rest of his life. The love story of Pedro Reis and Dolly Jacobs has a much happier ending, one which serves as a romantic reminder of the power of two. Circus Sarasota will open its 2008 season on February 1 and run through February 24. 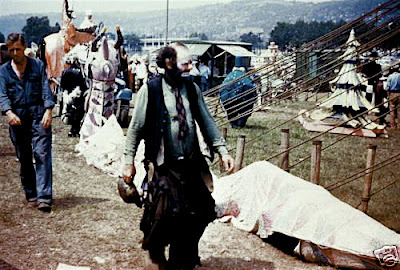 For more information, visit www.circussarasota.org. Here's wishing that the immense joy that your artistry has created over the years be returned to you a thousand-fold on this, your wedding day, and from this day forward into your new lives together as husband and wife. 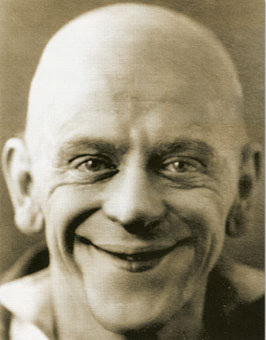 Mark Anthony in an undated photo from the DeSanto archives. If I had to guess, I'd say this is from the 1950s on Wirth's Circus in Australia. Sorry about the delay in posting today. The macbook is in the shop for repairs and probably won't be back for another 7-10 days. That means no new video until then. In the meantime I'll link to some video that I've been meaning to link to for awhile and post some of the backlog of photos that have been piling up here in my downstairs office. 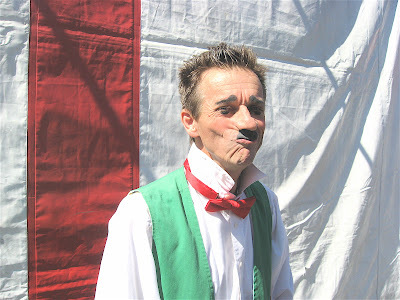 An udated photo of Muttville Comix frontman Johnny Peers. Johnny's father worked concessions for Ringling, where Johnny helped out. 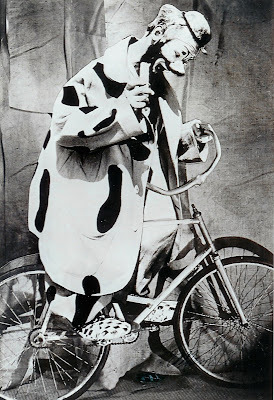 While working with his father he continually managed to sneak away to watch the clowns and eventually attended Ringling Bros. and Barnum & Bailey Clown College, class of 1970. He started the Muttville Comix a few years later. Click the title of this post to see them wowing the crowd at the Just For Laughs festival. 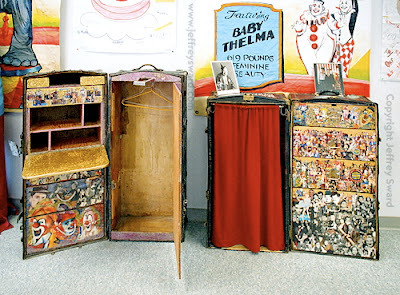 Trunks belonging to Tom Parrish (l) and Master Clown Glen "Frosty" Little as they were displayed at Ron Lee's World of Clowns in Henderson, NV. Photographed by Jeffrey Sward. A very quick video from Bill Strong of the Alley on the 1954 Dobritch International Circus in Winnipeg, Ont. This is a test as Bill emailed me the file last night and I converted it for mac this morning. Even though I upgraded the software I can't seem to get the words that appear on the screen to go away. But it's an interesting 20 seconds (the opening credits are longer than the video itself) so I thought I'd post it now and fix it later. If people can start emailing me video we're going to be opening this thing up to a lot more footage!!! 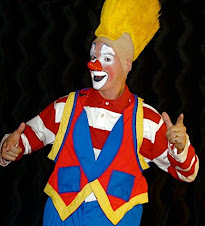 As for this, first we see tramp clown Jimmy Davidson, then Ernie "Blinko" Burch in his auguste makeup and finally whiteface John Toy who is probably best known to an entire generation who grew up on Bill Ballantine's book CLOWN ALLEY as the only guy in the world who Lou Jacobs didn't get along with. Mark Anthony performs a bullfight (with dogs as the bulls) on the Ringling Bros. and Barnum & Bailey Circus in 1964. The source footage is very dark so we see two performances of the gag from two different shows, the second of which I tried to digitally make a little brighter. In between we see Jackie Le Claire and Billy Ward performing a variation on Jackie's father's (Jack LeClair) "Spark Plug" bendover walkaround with Jackie replacing Barney Google's horse Spark Plug with a circus elephant. You know, of course, that my father created and built this bendover way back in the 40's. series. It was Barney Google's horse. The horse was always drawn with a full length blanket, not showing the legs. My father got the idea of what a great bendover it would make as you would not have to worry about legs. He trained me in it and I must say it was always a great surprise and made a big hit in the show and also on the South American, Cuban, Russian and European tours as it was different. He had the horse head from a wire frame and paper mache. The ears wiggled back and forth, the eyes used to light up and powder would shoot out of it's nostrils, making it all the more interesting. It was indeed, very heavy, so when he created the elephant, (he laughed that after all his year with circuses, he actually had to go down to the library to get a photo of what an elephant really looked like) it was done with simply a wire frame covered by grey material and accents. It was so much lighter! He always admired Paul Wentzel's piano wire creations and would have built it that way but working with piano wire, welding it, that was a skill that he did not have. Billy Ward worked the cloth and yes, he did it well in Russia (first time I ever worked with him) and Europe and the finish of the '64 season. I still have it, or rather it is stored at Chuck Sidlow's. We did do it once at Van Wezel. 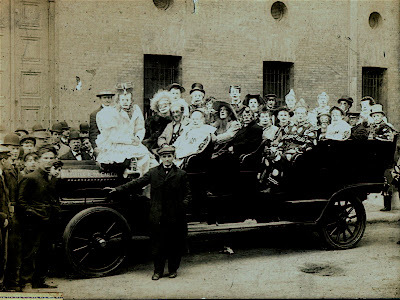 An undated and unidentified photo that features a group of early century American circus clowns in a large touring car. I may be wrong, but that looks to me like Frank "Slivers" Oakley sitting on the hood of that awfully long Ford! Can anyone out there confirm or deny? 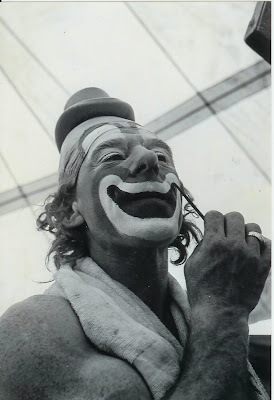 Emmett "Weary Willie" Kelly on the Ringling Bros. and Barnum & Bailey Circus in the early 1950s. Andrew Scharff, Gary "Gilligan" Spear and me (appearing as me) at the recent Happy Tiandu AEMI World Clown Festival. 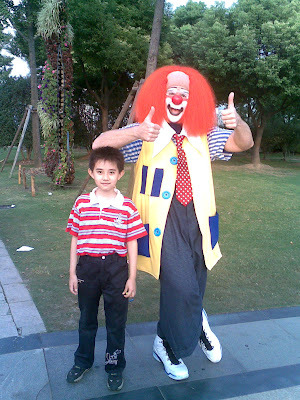 Mark Lohr as me at the Kimtom International Clown Festival in Shanghai, China. Mark is appearing as me, not only with my permission but my blessing as well. Larry Harmon and Barry Lubin are right! Franchising your character is really the way to go.